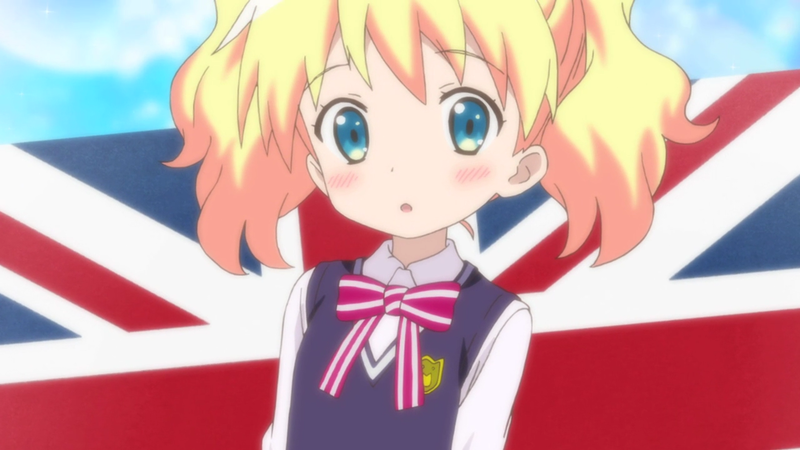 Kin-iro Mosaic – 11 | Mezashite! 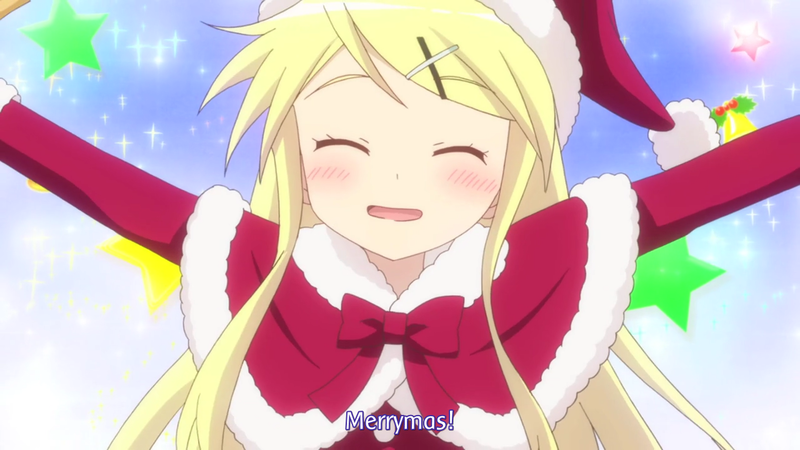 “Merikuri” (which is what she says, short for Merry Christmas) isn’t actually that unusual, but we didn’t think “Merrymas” sounded that bad. 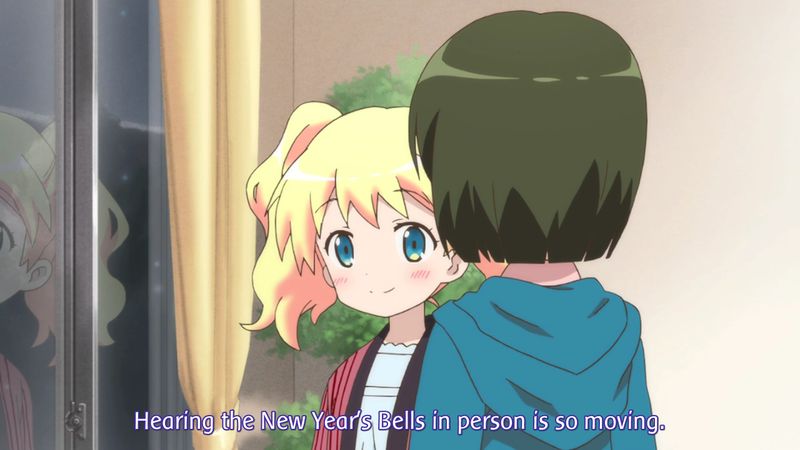 We couldn’t find good English shortenings for “Akeome” (short for “akemashite omedetou”, “Happy New Year”) and “kotoyoro” (short for “kotoshi mo yoroshiku etc.”, “let’s get along this year as well”) so those just got turned into Happy New Year later in the episode. If you have a good memory and stuff you don’t need this explained, since Karen explains it for you in episode 3 (I think). 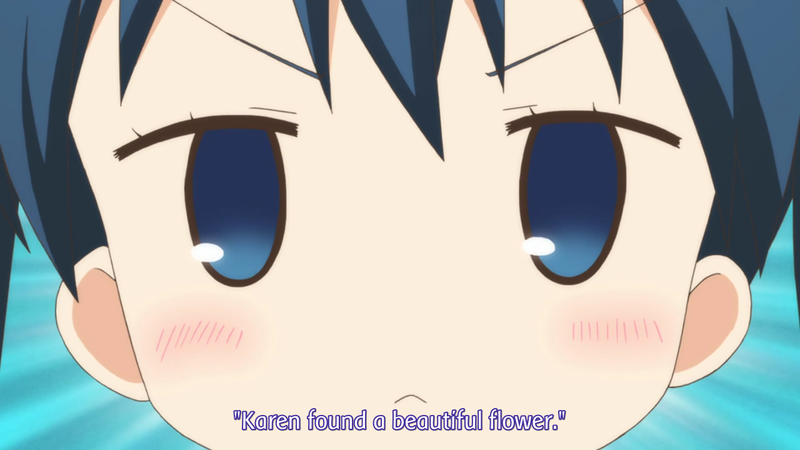 Karen’s name means “beautiful” (well, more like the dainty kind of beautiful, but whatever). 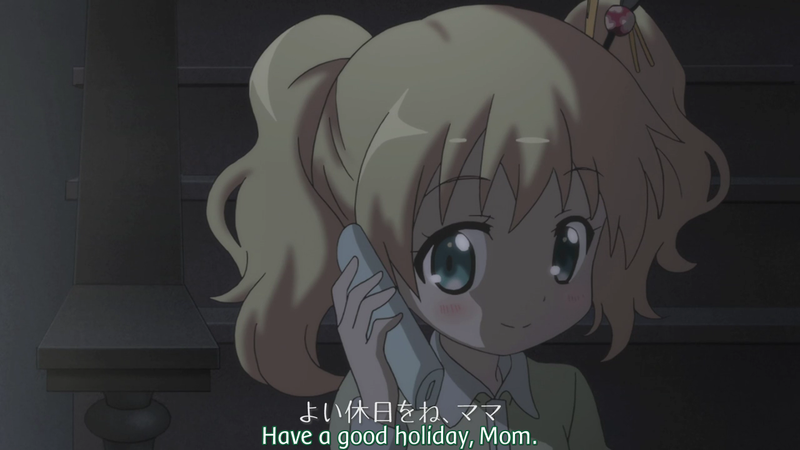 I’m like 90% British people do use “holiday” like that, but I’m not sure. In the first episode, we dealt with the English lines (namely the ones that came with Japanese subtitles) by translating the Japanese subtitles into English. Obviously, this sometimes resulted in a line that wasn’t exactly the same as what was being said. The reasoning behind this is that the Japanese scriptwriter most likely wrote the Japanese line first, and then had it translated into questionable English, so the Japanese line is closer to the creator’s intention. Therefore, we decided to translate the subtitles into our subtitles (thus maximizing information as well). However, we received countless complaints and flames about “changing” the lines. To me, there wasn’t anything to change — only lines to translate. And we could do a better job than whoever translated the writer’s original Japanese lines into English. Unfortunately, pretty much no one agreed. Therefore, this time, we presented the lines just as they are spoken in the audio. There are some places where the English audio straight up doesn’t make sense. 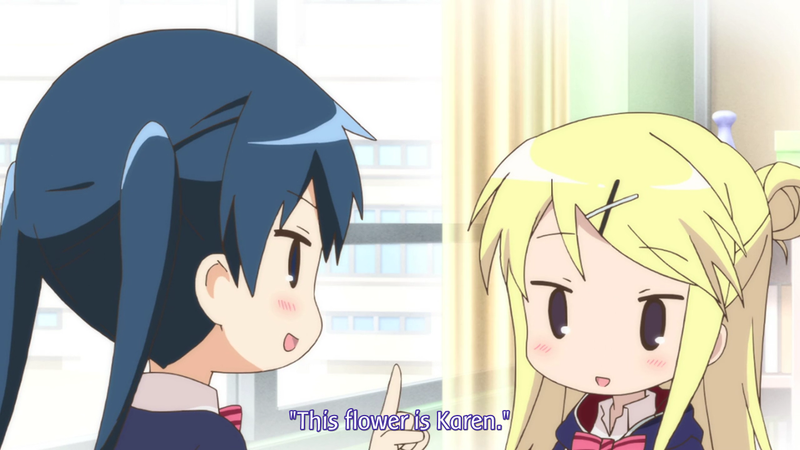 The Japanese subtitle says その通りです (“that is the way it is”, roughly), meaning that the events Karen just described actually happened. But that isn’t “that’s right”. 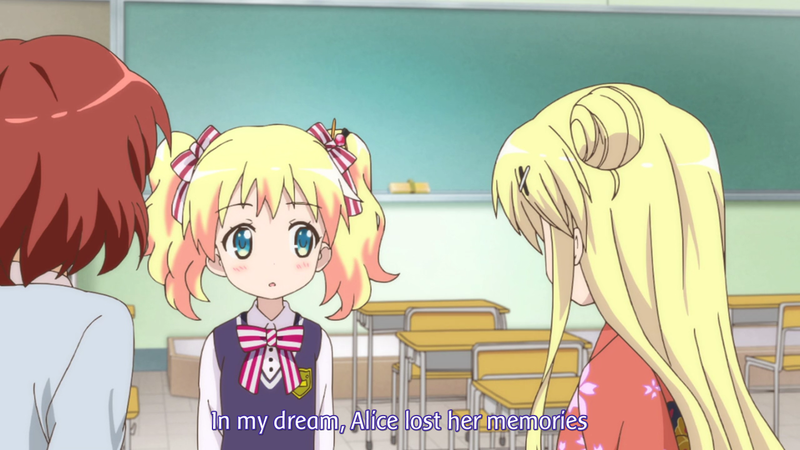 “That’s right” (when combined with our translation of the previous line) implies that Alice is saying “it is correct that Karen dreamed about that stuff”. So let’s see, how could we have worded the first line to make “that’s right” make sense? Nope. Pretty sure any way you do it, Alice’s “that’s right” ends up referring to the entirety of whatever Karen’s trying to say. And Karen is trying to talk about her dream. You either have to leave out the bit about the dream or change Alice’s line. And leaving out the bit about the dream is a little too, well, not right. Personally I liked that you translated the Japanese subs when they spoke English. The lines they’d actually say were pretty stiff and forced sounding most of the time. As far as a smooth viewing experience goes though, I can see how people might argue that hearing and reading two different English translations can be distracting. I agree with everything MegaMooseJam said. Also, thank you for the release ! Personally, I prefer transcription, or as-is presentation, as well. 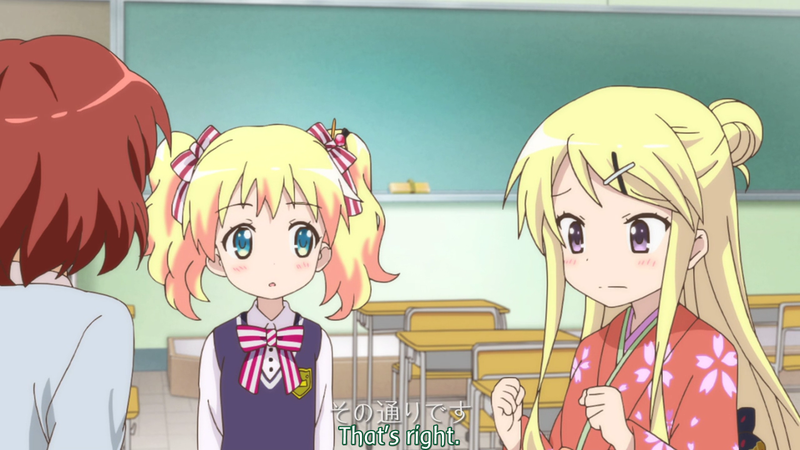 Since COCO Juku is involved in the Kin-iro Mosaic production (http://www.cocojuku.jp/info/130704.html), it should be safe to leave the original English lines are they are :). are they are -> as they are. You guys do the best job out there, so either way is fine with me. Personally I prefer your translations of the English lines, but in the end, you’re putting in the time and effort so honestly you should go with whatever you feel is best. I understand and appreciate the willingness to accommodate others’ opinions but the most important thing is that you are happy with the result. At any rate, thank you for the releases! There is another meaning of Karen too (I’ve seen it on one of japanese forum). 枯野 which means wither/die and the reading is kareno (which is accented by Ayaya).